Darren Tate presents the epic 'Prayer For A God', featuring the vocal talents of lead Bollywood and Jakatta famed Swati Natekar. The follow up to the huge Fall From Grace, this track combines tough electro style house with a euphoric break down to die for! Meanwhile the B-Side sees the classic track 'Elevation' which set many a dancefloor on fire. 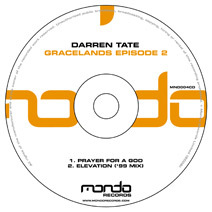 Mondo Records head honcho and internationally renowned DJ/producer Darren Tate (aka DT8 Project) is back on home turf. His latest masterpiece titled 'Timeless' has already been cre..